Governor Thomas M. Menino and his wife will be hosting the first Swan Boat ride at the Public Garden Lagoon. The kickoff event will be happening at 10:00 a.m. on Saturday, April 14th 2012. During the opening celebration event, they will also be releasing a new family-friendly map of Boston Common and Public Garden. The map was created by Boston Parks and Recreation Department. This map will be highlighting local sites for residents and visitors to see around the city, including spots like a 200-year-old English Elm, the Museum of African American History, the Tadpole Playground, the Brewer Fountain and the Frog Pond. With the arrival of spring season, we’re expecting more and more people to be heading outdoors to enjoy the beautiful weather. With more outdoor activities come more risks for injury in Boston. Residents are urged to be cautious when hitting the town. “We had such a mild winter that spring is here ahead of schedule,” said Menino. Our Boston accident lawyers understand that Saturday’s event is supposed to be a big one. Dignitaries will be joined by students from a number of area public schools, including John Winthrop Elementary School in Back Bay, the Conley Elementary School in Roslindale and the Ellis Mendell Elementary School in Roxbury, according to the City of Boston. As a matter of fact, this year is the 136th season for the Swan Boats. The smallest and oldest boat in the fleet just recently celebrated its 101st season on the water. The newest of the boats was introduced back in 1993. Nowadays, the swan on the boat is made up of either fiberglass or copper, depending on how old the boat is. Inside the swan is an enclosed paddle device that helps to make the swan glide through the water. When a Swan Boat is fully loaded, it weighs roughly three tons. Each boat can carry up to 20 passengers. They’re built on top of copper-clad pontoons that have air tanks in them to keep them afloat. After they’ve been stored in a safe spot away from the wicked winter, they return to the Public Garden Lagoon for the spring. 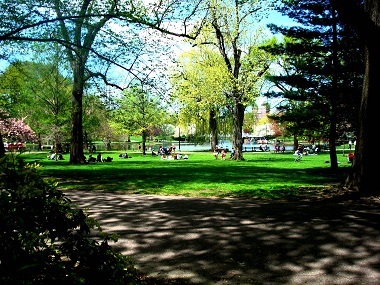 Residents and visitors are urged to get out there and enjoy not only the beautiful spring weather, but also all of the perks that the City of Boston has to offer. For the next few months, we can expect to see plenty of Swan Boat rides, tourists, pedestrians and bicyclists throughout our city. With the coming of a new season, let’s take this time to renew our focus on safety. It may seem like a care-free time to be outdoors in the beautiful City of Boston, but remember to keep it safe. Be considerate of others and make sure safety is a top priority. If you or a loved one has been injured in an accident in Boston or in any of the nearby areas, contact Massachusetts Injury Attorney Jeffrey S. Glassman to schedule a free and confidential appointment to discuss your rights. Call 877-617-5333.